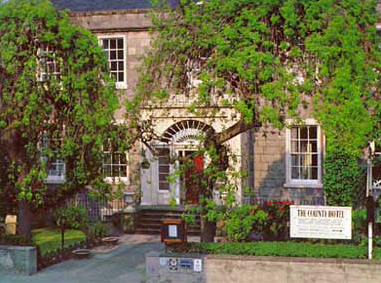 Whatever the season the County Hotel is here to welcome you, an elegant Grade B Georgian House offering fine views over the historical Royal Burgh of Banff, the Bay and the surrounding countryside of the River Deveron estuary. To the front of the house is a small garden with a pair of unusual weeping ash trees, whilst in the rear garden you may relax on secluded lawn and patios surrounded by flower-beds. The hotel car park adjoins the grounds. The County Hotel retains very much the country-house ambiance of former days and as resident proprietors we place particular emphasis on creating a relaxing atmosphere in our home.